In an isolated southern island lies a huge pit of fathomless depths where monsters dwell and relics can be found – if one can survive the deleterious curse that affects any who try to descend inside. Locals call it the Abyss, and a town has sprung up around the pit whose economy depends on its treasures. 12-year-old Riko is an orphan who aspires to be a Cave Raider and explore the Abyss like her top-ranked mother before her. One day while exploring an upper layer as part of her training, she encounters the strangest of relics: a being who appears to be part boy and part robot and, though he can't remember anything, seems to have come up from the depths. When a letter arrives that suggests her mother may be down there waiting for her, Riko feels compelled to go and takes Reg along with her. So begins their perilous journey of discovery, both of the wonders and dangers within the Abyss and within themselves. 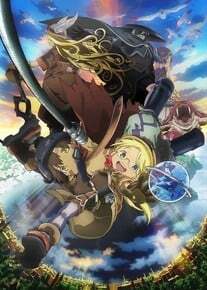 Journey's Dawn is a compilation movie that condenses the first eight episodes of 2017's Made in Abyss TV series into a roughly two-hour story. Its four-minute prologue is all-new, detailing the history of the Abyss' discovery and provides a scene from when Liza was pregnant with Riko, but other than a bit of extra narration by Liza, the rest of the film's runtime is taken directly from the TV episodes. So if you've watched the series, then you have seen nearly all this movie will have to offer. That being said, the movie is still well worth a look by returning fans and fully accessible to newcomers, thanks to a stellar editing effort. It takes both the crucial scenes and the proper connective tissue and melds them together into a mostly-seamless whole. There are a few places where the story flow makes it obvious that some details have been cut – Riko and Reg's survival training has been dramatically stripped down, for instance – and at times the progression of events can feel somewhat rushed, but so much of the content proceeds smoothly enough that the TV series may seem more padded by comparison. Taking the movie to the end of episode 8, where Riko and Reg leave the Seeker Camp and prepare to descend into the Great Fault, was also the perfect stopping point. Most importantly, this version even enhances one of the series' greatest strengths: its breathtaking world-building. Few other anime can rival Made in Abyss in the depth, expansiveness, or creativity of its attention to detail, from major points like the characterization of the Abyss itself to little details like the fantastically vertical seating of the classrooms or the eye-popping features of Riko's bedroom. I've never seen an anime more effective at evoking a sense of mystery and wonder around its setting; it's not hard at all to understand how such a horribly dangerous place can draw people in and inspire a nearly religious fervor in the Cave Raiders, as the Abyss invites a whole horde of questions with very few answers. All of this is accomplished without a single scene that feels like info-dumping; even when there is some exposition, it's kept brief and immediately relevant. Many other anime could take pointers from how Made in Abyss ' setting is composed. Of course, even the most fabulous setting would be nothing without compelling central characters, but the story has no concerns there. Riko and Reg are a delight to watch in action, both individually and especially together. The way Riko's exuberance is portrayed makes her stand out just enough from her genki archetype to make her memorable, while Reg serves beautifully as a stoic who isn't just putting up with Riko, but has his own powerful motivation for wanting to explore the Abyss. For the most part, Riko provides the willpower while Reg provides the superpower, making them an effective team. A number of other colorful personalities populate the story, none more so than Riko's mother, Liza the Annihilator. The dour Ozen the Immovable also makes a strong impression, and arguably the series' best supporting character makes a brief cameo at the very end. For those who are new to the franchise , the one word of warning about all this is that the story is nowhere near as lighthearted and kid-friendly as it appears at first. The darkest and most horrifying content will be found in the second compilation movie, but even in this movie there are Corpse Weeper birds, scenes of vomiting, or other shocking content. Also still present in this compilation are a handful of scenes that caused some wariness about sexualization of the child characters during the series' original run. On a second viewing, I did not feel that any of these scenes crossed into distressing territory, but your mileage may vary. The technical merits of Made in Abyss remain strong for this compilation film. It features some of the finest TV series animation in recent memory, with character movements more fluid and meticulous than usual, and a relatively high degree of quality control. Character designs that tend to emphasize larger heads hearken back to an older children's book aesthetic while still being rendered in an attractively modern fashion, and the occasional monsters designs are striking. Background art stands among the best in anime history both conceptually and visually, from the town of Orth to the earthy Seeker Camp to the various levels of the Abyss. The complementing musical score by Kevin Penkin is far from being one of the boldest or brassiest, but it is flawless a job in supporting the story in a more low-key way. This compilation movie also features Sentai Filmworks ' English dub . I had heard several initial concerns about Luci Christian 's interpretation of Reg, but any such worries quickly become an afterthought; Luci has extensive experience voicing young boys, so this kind of role isn't a stretch for her, and she handles it as well as could be expected. Brittany Lauda also shines as Riko, but possibly the most interesting casting choice is veteran Christine Auten as Ozen; her performance is not quite as deep in tone as the original by Sayaka Ohara , but the performance does well to make Ozen sound vaguely menacing. Overall, this compilation film provides an effective and efficient way to enjoy the first 60% of a series that was widely-regarded as one of the top anime of 2017. It's bound to look great on the big screen, so see it in theaters if you can.